Will You Farm with Me? Farming is a commitment—a vow to steward the land, to care for animals and crops, and to feed the community. Farming couples share this vision. They work with the added layer of managing a special personal relationship on top of a business. A passion for growing food, and finding someone with whom to cultivate the land, makes the farming experience sweeter, stronger and more fulfilling for many. That said, there are unique challenges and dynamics inherent in living, farming and working under the same barn roof day in and day out. Over the next week I will be posting a short Q&A with three different farm couples who have agreed to openly share the stories of their agricultural adventures, how they came to a common vision, the unforeseen of farming together and advice for partners considering starting a farm. 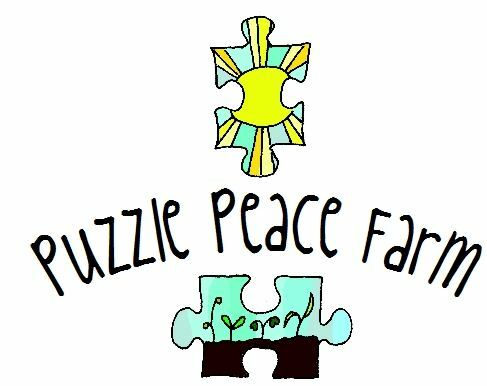 The first profile is from Puzzle Peace Farm in Bostic, North Carolina. We are blessed to have family land available to us, bordering beautiful Puzzle Creek, hence our name. The landscape is diverse, ranging from fertile bottom-land to sloped and terraced upland. Each terrain presents its unique advantages and challenges, both of which we learn more about each year. Our main focus is on diversified produce production… from asparagus to zucchini and many in between. Laying hens are a part of this as they are rotated through our fields leaving their fertile manure. Their delicious eggs are an added bonus. We have dairy goats for ourselves and have raised some goats and hogs for meat to sell in the past, and possibly again in the future. For now though, the meat products are on hold so we can better hone our vegetable growing skills. We are committed to sustainable growing methods. Though we are not certified organic, we do abide by the standards. In some respects our personal standards go above and beyond those of organic certification. For example, we don’t use plastic weed control because it is disposable from year to year, petroleum-based (or corn-based, which is about the same in the end), and doesn’t contribute to soil health. We use natural mulches instead. How long have you been farming together? This is our second year farming together. What brought you to a shared farming experience? We both had been farming independently for a couple of years and met at a farmers potluck. We showed each other our farms and fell in love shortly thereafter. What are each of your responsibilities on the farm and how do you decide who’s in charge of what? Tough question. We started with equal say in all matters and soon realized how different our methodologies were. Basically we each have our favorite vegetables and on those crops we each have the final say. As for other general decisions and chores, there is no decisive method in stone. We just get things done from day to day, usually based on our own strengths or weakness. Thomas is a green-blood, and has been working on farm equipment since he was very young so most welding and tractor work falls to him. Lindy values the stability of the routine and does chores associated with the hens, and the greenhouse, handling most of the transplant production. What outcomes of farming together are most rewarding? We both get to share in the accomplishments. Our good days are good for both of us, making it a great day. And who better to share this amazing food with? We eat like royalty. It’s impossible to separate our farm life from our home life. In comparison with the last question, when there is a disagreement in the field or about something to purchase, or how to prioritize something… it is hard to put it all aside when you walk in the house for lunch. The farm is your life, so you have to love it for it to work. The evolution. Though I expected change in our mindsets it is impossible to know what change will come. As a minor example, I was determined to expand into meat goats. With some frustrating experience and some debate and persuasion from my partner, it is likely that won’t happen. Which is fine by me. But on my own I’d probably be out there right now chasing goats out of the chard patch. Any advice for others choosing to farm with their mate? Thomas: Farm Internships. Do it as a couple if possible. Though it won’t prepare you for everything by any means it will give you a feel for the life. Save as much money as you can and make sure you are both on the same plane of frugality going in to the venture. Cash flow will be stressful on your own, much more so when one of you think you need this particular implement to continue and the other thinks you should expand into rabbit production instead. Learn to improvise with what you have and be willing to compromise greatly. Lindy: Listen first, then talk. ← Occupy Our Food Supply – Today!